Important notice to the Nnamdi Azikiwe University (UNIZIK) graduands on payment of convocation fees (irrespective of attendance), dress code, collection of Academic outfits and other important details pertaining to the 13th convocation ceremonies. Important information to all 2017/2018 Graduands of Nnamdi Azikiwe University, Awka, as regards payment of convocation fees, hiring/purchasing of academic gowns and mode of payments. See also: UNIZIK 13th Convocation Ceremony Schedule of Events. Graduands are please requested to note the following. It is mandatory for all Graduands to pay for the following items irrespective of attendance to the Convocation Ceremony. UNIZIK Convocation Fees & Outfits Collection Details. II. Academic outfits for all first degree Graduands will be collected at the Faculties and Departments. V. Collection of Convocation materials commences on 6th May, 2019. VI. All hired academic outfits/gowns should be returned by the Graduands to their respective collection points not later than Wednesday 15th May, 2019. Gowns returned after that date will attract penalty. VIII.It is compulsory for all Graduands to participate in the academic procession and to put on the approved academic regalia. UNIZIK Convocation Fees Mode of Payment. 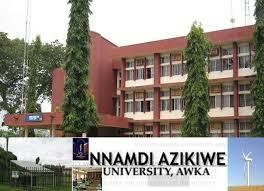 Under the name of MDA type Nnamdi Azikiwe University. Take the RRR number to any bank of your choice nation -wide and make payments. Payment will begin on Monday 15th April, 2019.